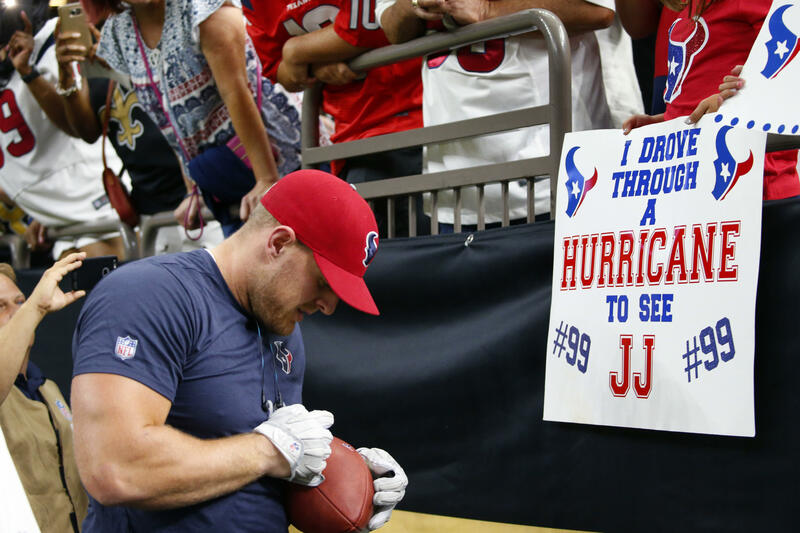 Houston Texans star JJ Watt has set up an online fundraiser to help victims of Hurricane Harvey, and personally donated $100,000 for those affected by the storm. "That's our city. It's very tough to watch our city get hit by such a bad storm and not be there to help with the recovery," Watt said in a Twitter post. "I know these recovery efforts are going to be massive." In a Skype interview with "CBS This Morning," Watt said he was feeling helpless waiting out the storm in Dallas while Houston suffered such widespread damage and hardship. "To see it going through such a disaster and not be there, not be able to help, it's very difficult to have to watch it from afar and see it on TV and look at streets that you know and you can barely recognize them under all the water," Watt said. According to the YouCaring fundraiser called "Houston Flood Relief Fund," Watt himself donated $100,000. "Houston, we're in this together," Watt said in a description of his donation on the fundraising page. CBS Houston affiliate KHOU said $30,000 in additional donations poured in within the first hour. By Monday morning, the total had surpassed $300,000. A few hours later, Watt announced that the fund already exceeded $500,000. "Phenomenal stuff from donations both large and small," he said on Twitter.